The allure of this captivating 18K white gold ring is the abundance of brilliance and light in its trio of diamonds: a 1.52 carat Fancy Brownish Yellow oval flanked by a lively pair of collection quality SI half moons, 0.43 ct. tw. They are respectively framed by identically shaped halos of 46 white melee diamonds, 0.35 ct. tw. that also adorn the center sides of the head in artistic “U” shapes. 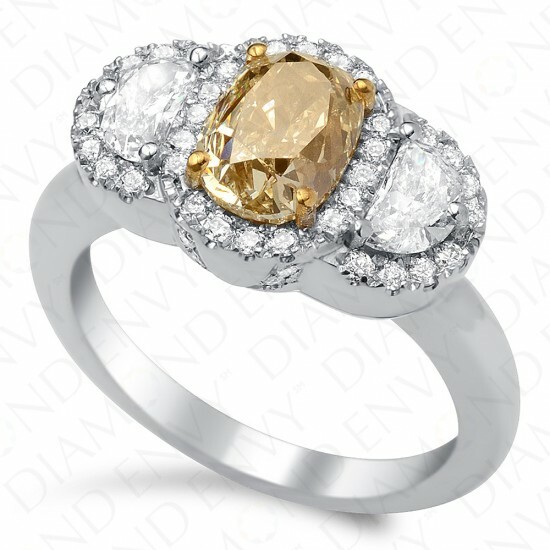 The three diamonds are spectacularly matched for brilliance and fire. Gold weight: 7.00 grams. House-graded. PLEASE NOTE: This item is sold. We have kept the listing active to help inspire your own custom design project.Contact our design team to create something similar, or another style you like.